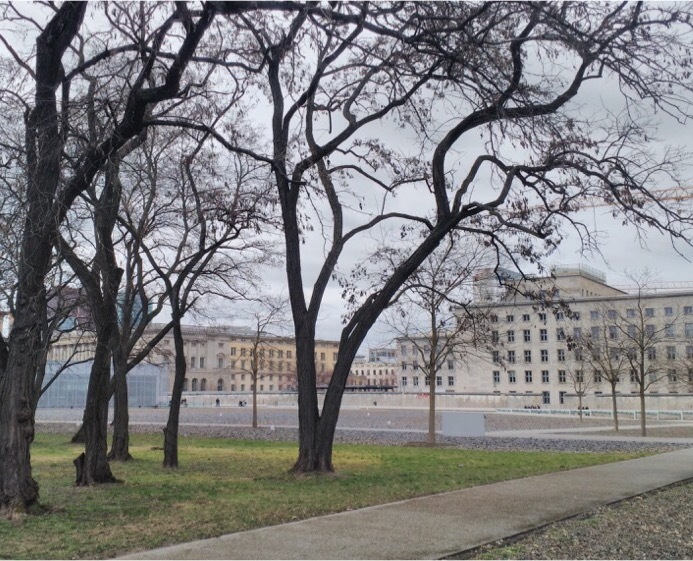 On my private guide city tours in Berlin I stop regularly in Niederkirchner Strasse, right by the remnants of the Wall, to show my guests the Topography of Terror on the World War II tour. Each time I’m there, I can’t help noticing that the place holds a very special memory for me: this is where I, at the age of 13, made my first attempts at driving a car. The Topography of Terror is an exhibition documenting the terror the Nazis brought on Germany and Europe between 1933 and 1945. Previously there were several buildings on the site, all taken over by various Nazi organizations: the former School of Arts and Crafts was turned into Gestapo headquarters, the adjacent Hotel Prinz Albrecht was the seat of Himmler’s personal staff and the SS Head Office, while the 18th-century Prinz-Albrecht-Palais in Wilhelmstrasse was mainly used by the SD, the SS intelligence unit. The buildings were all destroyed in WWII. The removal of the ruins in the 50s created a sizeable wasteland in the city centre. Things changed dramatically on 13 August 1961: the lot was suddenly in a very inconvenient place right up at the Berlin Wall. Nobody would have considered erecting any kind of building there and even the West-Berlin government had no idea what to do with this piece of land. Along came one of the oddest fellows in a city certainly not deprived of odd people: “Straps-Harry” – the nickname literally translates as “Garters-Harry”. In 1970 he opened the Autodrom, a course of narrow paved roads, allowing patrons, for a small contribution, to drive in their own cars or in the wrecks that could be rented on site. As this was private property you didn’t need a license. Straps-Harry had made and had lost millions. In the thirties he owned a food products factory, in the seventies, among other things, a travesty show. Since he was 18 he regularly wore garters and colourful woolen stockings. He had a hippy-style haircut decades before any hippies did. On my thirteenth birthday my father decided it was time I learned to drive and so he took me to the Autodrom. Naturally he was concerned for his own car, so we rented one of the wrecks. I was quite bewildered by the man behind the counter where my father paid. I had never before seen such a strange man. After two hours of combat with clutch, gas and brake I was more or less familiar with the operation of a car. My father and I went back twice to the site, the terrible history of which I was yet unaware. When I passed my license at 18, all I needed was the statutory minimum of six driving lessons. Thanks to Straps-Harry and his Autodrom.